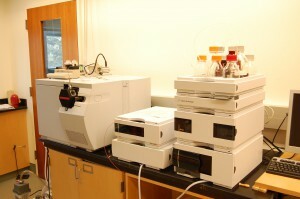 The ESI allows for highly accurate mass and elemental analysis of small molecules up to about 3000 Da. The ion trap allows the user to physically capture molecules which can then be studied in greater detail by breaking the molecules up and measuring the mass of the resulting fragments. Through the use of a coupled high pressure liquid chromatograph (HPLC), complex environmental and biological samples can be easily analyzed.